Creation Ministries International regularly receives questions on topics ranging from the Biblical viewpoint on stem cells to the Biblical perspective on ‘life in outer space’. Recently, someone e-mailed us with questions on vaccinations and the human immune system. We thought the answers (by Dr Carl Wieland, a former medical doctor, now CEO of CMI-Australia) were such that they would be beneficial to others. The email is reprinted below with Dr Wieland’s reply interspersed. My husband and I have declined to have our 4 children vaccinated. We believe that vaccines are neither safe or effective. [Carl Wieland (CW)]: Although CMI has no official stance on this, my personal view is that, while there are indeed safety issues, there is also a danger in not vaccinating, and that the balance tips in favour of vaccinating. What is (if any) CMI’s stance on serum taken from monkeys being added to some vaccines? [CW]: You may wish to clarify your source of the information. I doubt whether this is accurate information, but it may have some basis in fact. For example, antitoxins, like tetanus antitoxin, are made by injecting horses with a small amount of the toxin so that the animal produces the antibodies. This is extracted from the animal and then purified. However, allergic reactions sometimes still occur in the human recipient of the antitoxin. Note that an antitoxin or antivenene is different from a vaccine. A vaccine stimulates your own body to produce its own antibodies naturally; it would not be used to treat a person who was sick with the disease in question. An antitoxin, on the other hand, uses antibodies produced in and by another organism (ideally a person, but often this is not feasible for commercial quantities) to attack the poison. For all the above reasons, I would not think that adding the actual raw serum from an animal to a vaccine (which is different from an antivenene, or an antitoxin) would have any benefit. And by adding foreign proteins, it would cause a potential problem. This stemming from the theory that human beings and monkeys being so ‘closely related’. [CW]: Let’s assume for the moment that something is being done with monkeys (e.g. being used in medical research) based on that false theory [our alleged relationship with them]. If we simply change the rationale, i.e. we say that the reason we experiment on monkeys is because they are more similar in their created design, then we have the same practical outcome, but a different philosophical framework. Just because something is inspired by evolutionary thinking doesn’t mean that thing should be rejected automatically. In logic, that is known as committing the ‘genetic fallacy’. It’s an easy trap to fall into, though. Some diets, for instance, are justified on evolutionary grounds, but if the diets work, should we reject them? I would suggest that if they work in keeping us healthier than otherwise would be the case, then there is a better creationist justification available, by definition, because the history in the Bible is true. Or what view do you take on any vaccines that are supposed to improve on the natural immune response that God gave us? [CW]: I believe that man was given dominion before the Fall, as Genesis teaches, and we can see that nowhere in the Bible was this dominion taken away. Much of medicine and healing efforts are attempts to counteract the Curse, and Scripture continually praises the sorts of actions that are local and temporary attempts to overcome the Curse’s effects. The Curse brought man into conflict with man—yet ‘blessed are the peacemakers’ (Matthew 5:9). The Curse brought disease and suffering—yet alleviating suffering is not only consistent with Scripture, it follows Christ’s healing example. I.e. it is blessed to seek to improve on our natural healing when we apply a bandage, or an ointment, and is certainly not acting against God or His will (see also Reshaping People). An approach that said we should not do anything to assist our ‘natural’ defenses, if taken to its logical conclusion, would mean we should watch passively as a child died from infection, and not give him an antibiotic, because an antibiotic is supposed to improve on the germ-fighting ‘natural’ defenses which God has given us. Being ‘natural’ is not necessarily good. That is because we are in a fallen world. The measles virus is totally ‘natural’, but it is not ‘good’. Where man’s manipulations in medicine (using our dominion mandate over the natural world) do good in healing, they are justified ethically and Biblically, but this does not mean that they are infallible. E.g. looking for/developing, and then applying, an antibiotic to save a child’s life is justified; but that same antibiotic may kill some people from allergic reactions. That does not make all antibiotics bad. And was this immune system only needed after the fall? [CW]: This is an interesting question. I suggest that since God foreknew the Fall (see chapter 6 of The Creation Answers Book) He certainly would have known that the immune system was needed soon anyway, so it may be a non-question. However, the immune system does not only protect against disease, it also helps the body to distinguish between self and non-self. It helps, for instance, to keep the ‘normal’ bacteria in our colon from spreading into the bloodstream, where instead of being helpful, they will be harmful. Since such helpful bacteria would have existed before the Fall, I think it is likely that our immune system played some role in shepherding them in this way. Are vaccines biblical, safe or effective? 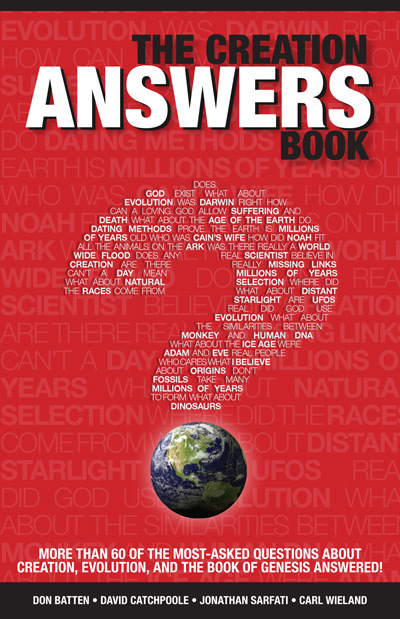 Answers over 60 of the most-asked questions in 20 categories: • Does God exist? • Six days? Really? • What about gap theories? • What about carbon-14 dating? • How can we see distant starlight in a young universe? • What about arguments for evolution? • How did bad things come about? • Who was Cain’s wife? • Were the ‘sons of God’ and/or the ‘nephilim’ extra-terrestrials? • Was the Flood global? • What about continental drift? • What about all that water? • How did all the animals fit on the Ark? • How did fresh/saltwater fish survive? • Where are all the human fossils? • How could animals get to places like Australia? • Were there really ice ages? • How did the different races arise? • What about dinosaurs? • What can I do?